AOH Dues: You can pay your annual $30.00 dues by credit card. This is a secure site and you do not need a pay pal account. Click on Add to Cart button below. After you pay your dues, please consider making a donation on the right. Click continue shopping on the upper right of your shopping cart page to return for donations. Thanks for helping. Donations: Please consider a donation to help with our mission. Click continue shopping on the upper right of your cart page to return for donations. Choose your donation amount an click Add to Cart button. 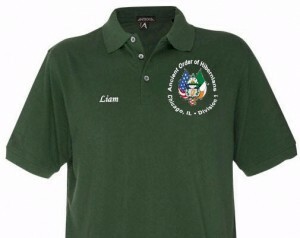 Pay for AOH DIVISION ONE shirt online.